I don't often participate in exhibitions so when I was invited to submit several pieces for the Greenhill Gallery at the Greenhill Center of the Arts exhibition Beauty of the Beast, I was extremely honored and thrilled to participate! Below are the details and concept behind the exhibition. So many amazing and talented artists from North Carolina and abroad. What I love most about the concept behind the exhibition is merging art with the wild - because when you truly think about art - nature and the wild is the ultimate creation, the ultimate form of art. And North Carolina has such a rich history of both art and appreciation for wildlife. I truly became in touch with animals and my own inner strength because of them when I moved to Eastern North Carolina. I hope that the exhibition brings attention to preserving our parks, rivers, streams and oceans. Now more than ever we need to be aware and also be active in our wild environments. If you live in Greensboro, I hope you can attend the exhibition and events the amazing staff at the Greenhill Center of NC Arts have organized. The Bast One of Kind necklace will be on display along with other signature EJ pieces. I'm a big believer in female friendships; sounds corny to say but I love quality time with my girlfriends. We can talk, and talk and talk and get complete understanding from each other when we may not get that from our boyfriends, husbands or significant others. And it's not just that but it's more that understanding of what it's like to be a woman. Cate, myself and Caroline, two of my favorite Galentine's! So I propose that we show the love and appreciation for our girlfriends just as we would to our male counterparts. Even if it's just a card, why not let them simply know that you love their friendship? I grew up watching my Mom send thank you cards, little gifts and momentos to her own friends and family. She made it a point to remember peoples birthdays. And it has rubbed off on me. And nowadays with the written word dwindling in favor of electronic correspondence it means even more to get that piece of snail mail. I LOVE getting an envelope from a friend of family - because it's the first thing I open other than another bill! 1. Cat claw earrings - This one is a no brainer, most of my girlfriends are cat lovers and these are super affordable and sweet. 2. Sage & Palo santo smudging - Aroma and scents are very powerful, and what woman doesn't need a good cleansing of the spirit and home? These are only $10 and smell so earthy and good! 3. A beautiful print - Just as much as I love a good scent, I also adore hand drawn prints. It's calming to soak in an image of a powerful animal. And Nest and Burrow prints have gorgeous detail. I really love the Quietus of Munin crow print. 4. Wine profile card set - I got this for one of my girlfriends for Xmas and she loved it. Most of my lady friends are wino's and it's fun and sweet. Plus it passes on the point of sending out cards. You could even use these to send to your galentine! 5. Gem and Honey infused bath salts - I just bought these on my last visit to Everyday Magic and I love them! I'm a big bath person, it's my self care ritual and most women enjoy a good soak, with a glass of wine of course! Your galentine needs that self care too. It's not too late too order any of these items and get them to your bestie - show her you appreciate all the times she listened to you and gave you advice or rescued you from a bad date! I'm in TOTAL NESTING mode - as ya'll know I'm pregnant (7 months to be specific) and my husband and I moved into our newly purchased home last year in August. Since that time I've slowly decorated and painted several rooms in our house. I'd never been able to paint any of the rooms I lived in because I rented but now, I'm crazy about using colors (hence my previous post). And not just colors but artwork that inspires me and makes me happy or serene. I love looking at my walls and seeing artwork by other makers and people that are talented and create beauty in the world. I consider it an investment in my happiness and gallery of objects. I grew up this way, my parents traveled often due to my Dad being in the army and they purchased beautiful pieces of furniture, jewelry and objects from Japan, Taiwan, Peru, Argentina, Uruguay, Brazil, Venezuela, Panama...the list goes on and on. Thus, I have a brief list of new artists I've discovered that I've either acquired pieces or plan to. 1. Christina Mrozik - Absolutely stunning hand drawn artwork that reflects beauty in death and animal still life. Her use of opposing colors (bright versus dark) and shading is exquisite. I'm very excited that I'll be acquiring one of her pieces in the not too distant future! EEEk! I'm getting this one soon! 2. Yoann Lossel - Yoann's pieces reflect an ancient quality, one that seems as though the scenes he captured actually happened. I find that I could create an entire story just looking at his prints. I just receieved La Morrigan in the mail!!! I can't wait to frame it and hang it up. I plan on purchasing this one soon! 3. Silver Linings Ceramics by Katie Marks - This artist creates intricate crystal and gold leafed ceramics and when they are listed on her Etsy site, they are snapped in SECONDS, meaning you have to watch her like a hawk when her pieces are listed. I doubt I'll ever get one but it's a dream to have her crystal mug - to not even drink out of it but just to behold it and own it! 4. Tanel Veenre - I've long admired Tanel's dreamy pieces. He's a poet too. He writes as if speaking of other dimensions, which his jewelry pieces also reflect. 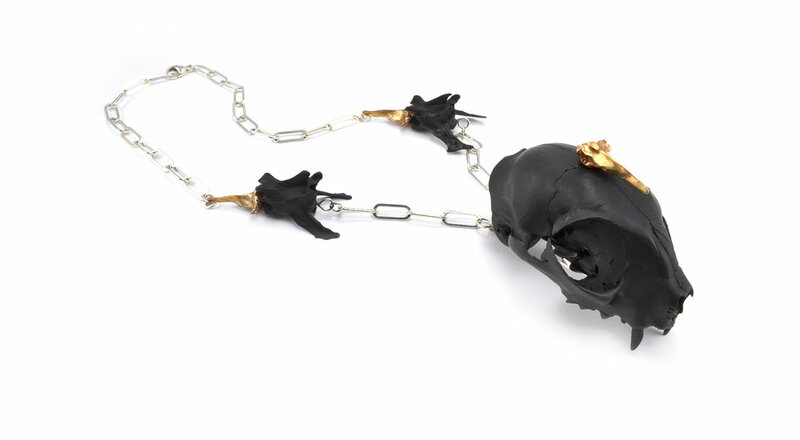 Tanel composes jewelry that are disparate but seemingly well paired and appropriate. Being from Estonia, there is an ethereal quality to all his adornment. I don't think I'll ever own one of his pieces, for now I am happy with one of his books. I hope you enjoyed my post of beautiful things - we all need that in our life! My interaction with Crows in the Pacific Northwest.